Wee Cott is a detached, privately owned traditional style holiday chalet, at Riviere Towans, Hayle, St. Ives Bay, Cornwall. and only 4 minutes WALK from the wonderful beach. Ideal for ~ surfing ~ swimming ~ parasailing. We’re both here, and it’s lovely heaven on Earth. Been down to the beach, and the sun has got its hat on. Accommodation consists of 3 bedrooms: 1 double, 1 single and 1 twin room. Also provided is a travel cot & high chair. There is a hair dryer, duvets and pillows, but please bring your own bed linen (sheets, pillowcases, duvet covers and towels). There is a comfortable open plan sitting room with a dining area and kitchen. There is an outdoor eating area behind the chalet and a rotary dryer for all those wet swimming costumes, after you’ve been for a dip in the beautiful deep blue sea! Wee Cott is on a quiet family site and it’s only a few minutes walk across the dunes to the sea. The Towans consists of 400 acres of dunes which are covered in flowers during the Spring and Summer months. In the evenings, watch the ever changing colours as the sun sets over St. Ives Bay. It’s perfect! The kitchen which has been refitted in 2019 is equipped with a halogen hob, separate oven, grill, fridge, microwave, George Foreman grill,slow cooker, and washing machine. Lots of cupboard space, crockery, utensils etc. A small dining table separates it from the sitting room area, with four chairs and folding stool. The open plan sitting room is timber clad in a traditional seaside style. It has 2 faux leather sofas & contemporary electric stove style fire. Also free standing electric heaters in the bedrooms. A small table between the kitchen and sitting room, with four chairs and a folding stool. The bathroom has instant electric shower, wc and basin and a beautiful marble floor. Flat screen TV with Freeview and DVD player and a CD/Radio. Free WiFi is available across the site. Well behaved pets are welcome. There are beach restrictions in operation across Cornwall in the Summer months. We have a map of dog friendly beaches in the chalet. Dogs are permitted on Mexico Towans, which is to the right as you go down to the beach. There are 2 sun loungers stored under the bunk beds for your use. 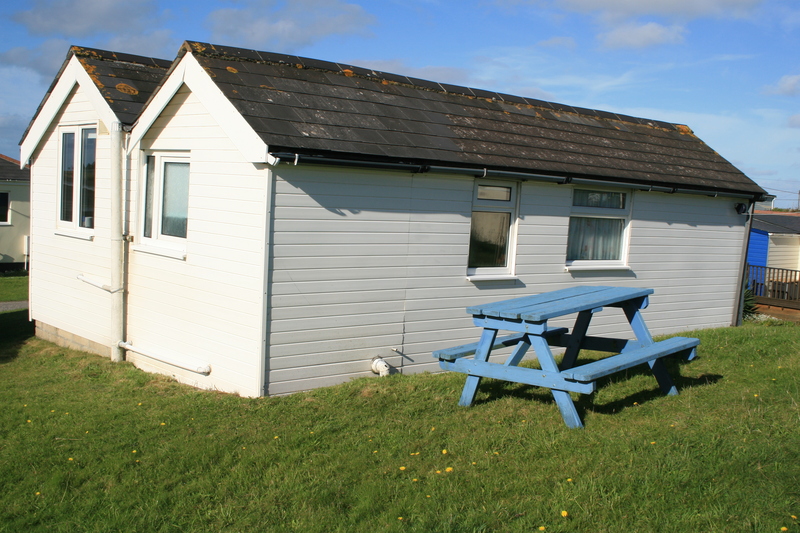 We also privately own 66 Trevithick Court, Tolroy Manor, Hayle which is available to rent all year round. See further details on this web site.